Cover Description: Booster stands before a blue background and the façade of his new mansion and headquarters of Booster Gold International. Brief Synopsis: Booster re-adjusts to life in 1987, launching a new phase of corporate growth and adventure. Issue Notes: Booster first meets Maxwell Lord when he is invited to join the Justice League. This is the first issue inked by Bob Lewis. Though Jergen's layouts are clearly recognizable, with all of his signature trademarks (such as action and actors exploding out of panels and visual story pacing), the finished work is unusually ungainly and, in my opinion, the worst in the series. This issue also features two recurring Titans' characters, Cheshire and Hawk. There's probably more than coincidence involved in Booster's recent appearance in The New Teen Titans if his own series now showcases Titans' characters. Dirk presents Booster with his new headquarters to replace Reilleau Towers: a $2.7 million, 32-room, ivy coated mansion located at 325 York Avenue in Metropolis. Extensive renovations have been performed to the building for Booster Gold's use, including a rooftop force field projector and an indoor swimming pool. It is never made clear if Booster has purchased this mansion, or if he is renting it. Booster dresses like a member of the Talking Heads, wearing a white suit with black shirt, red tie, black belt, white socks, and untied red, hi-top Converse Chuck Taylor All-Stars. The sleeves of his jacket are pulled up to his elbows. Dirk reveals that Booster returned from the future after 4 months of relative time had passed. If Booster returned in March 1987, he would have left in December 1986. Rip calls Booster the Dynasty of super-heroes. Dynasty was a prime-time soap opera that ran throughout the 1980s. It focused on a rich oil baron and his family and inspired fashion and style throughout the decade. 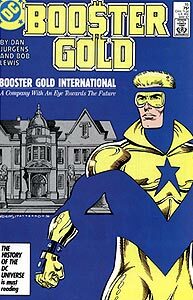 Booster formally announces that Goldstar, Inc. has changed its name to Booster Gold International (B.G.I.) in order to compete with such corporations as Lex Luthor's Lexcorp and Doom Patrol ally Steven Dayton's Dayton Industries. Booster outlines the organization of B.G.I., noting "Dirk and Trixie will head the expansion, while Jack will oversee a high-tech company." There is no mention of why Rip Hunter was invited to the meeting or what responsibilities, if any, he will have in the new BGI. In fact, he will be seen only sporadically through the rest of the series. SILVER SCREEN: Booster finally says goodbye to Monica Lake, though she demands the part he promised her in his upcoming movie. Booster fumbles the opportunity to make a romantic overture to Tixie Collins. MEET THE PRESS: Booster makes his first public appearance in months, debuting the building that will replace Reilleau Towers: Goldstar Towers. Dirk bills Booster as the Corporate Crusader and Skeets as the Mechanical Marvel. Booster is wearing a cape for the first time in several issues. Clark Kent, among the reporters at the press conference, will leave in disgust when Booster and Dirk brag about Booster's responsibility to the public. Reilleau Towers was financed by and named for Francois and Marcel Reilleau. 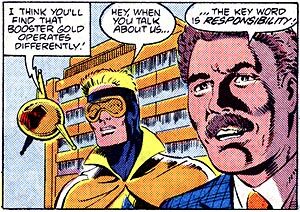 The Reilleaus were revealed to be compensated by the loss of their property via Shocker in Booster Gold, Vol. 1, #11 through insurance payouts. It begs the question what kind of insurance plan pays for destruction of a property at the hands of a super-villain? FASHION ALERT: With the appropriate line, "Right after I dump this cape," Booster permanently removes his cape. This is the last time that Booster's costume will be seen to include a cape. Skeets prevents an accident at Metropolis Raceway by stopping the time trials for the Metro 500 so that Booster can land the injured blimp. It is not stated, but the blimp was indubitably present to cover the race, where Goodwin tires are in use. POWER DOWN: Jack Soo orders Booster to leave his force field off except in cases of emergency in order to build Booster's immunities to 20th-century diseases. This will have the added benefit of extending his power-suit's battery life, preventing a recurrence of the recent power failure. Michelle reveals 25th-century prejudices against robots, speaking insensitively about Skeets despite his presence in the room. While Booster has occasionally treated Skeets as a tool, he has never openly displayed any intolerance for his computerized sidekick. Sarah Davis reveals that her mother, Dirk's wife, "left us." The reasons for this are never made clear, though Dirk's future actions will give plenty of possible reasons. Appearance of Cheshire, a respected and feared mercenary assassin in the DC Universe. Cheshire is first seen only by her distinctive green boot heels before being fully revealed on the next page. FIRST APPEARANCE: First Appearance of U.S. Biotech. Though it is not made immediately clear what the firm does, it has something to do with biological research of a highly-sensitive nature (and is therefore aptly-named). FIRST APPEARANCE: First Appearance of "Doc" Pete Babich. Doc Babich will be one of several antagonists in the next issue of Booster Gold. Appearance of Hawk, one-half of the defunct super-hero team of Hawk and Dove. Hawk's brother and partner, Dove, was killed during the recent Crisis on Infinite Earths. Like Cheshire, Hawk was first revealed by the heel of his boot. Maxwell Lord, mysterious backer of the newly formed Justice League, has broken into Booster's new mansion to secretly invite Booster to join the Justice League. Ostensibly, Max attempts to bypass Booster's security to avoid any media attention. This confrontation is the first meeting between Booster and Max. Max's business card identifies his company as Innovative Concepts. The telephone number on the card, though difficult to read, begins with "212," the area code for New York City. Booster, of course, accepts Lord's invitation. At the time, he is wearing only boxer shorts, an amusing juxtaposition since Booster is being invited merely for the power that his futuretech power-suit provides him. Max insists that Booster keep the news a secret until such time as he reveals it. Boosterrific Review: This comic book is the Neapolitan ice cream of Booster Gold issues: a day-in-the-life story focuses on the changes in Booster Gold's life. From the reorganization of Booster's corporation to Maxwell Lord's invitation to join the Justice League, this issue covers a lot of ground in indicating just how much Booster's life has changed in a little over a year of issues. Except for the 4-page interlude establishing the events of next issue, this comic stands alone and is an opportunity for new readers to get up-to-date on the life of Booster Gold prior to his induction to the Justice League. Pretty enjoyable issue, and I liked seeing the specs of the Booster mansion. Max Lord's debut in Booster's life is interesting but there really is not much else going on here of any long term consequence. That is to say there is a lot going on here but it won't matter much in a few issues.